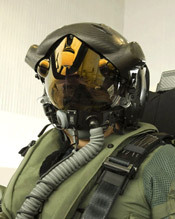 Check out ParaNav, the new helmet-mounted GPS navigation system for parachutists from Rockwell Collins. It's also a flight management system with built-in head-up display, helping you fly to your planned landing destination. Apparently it works at 28,000 feet and temperatures of -20 degrees. However, this ain't for weekend parachutists: it's meant for military types. All I can think when I look at it is 'Master Chief' though - perhaps the designers were big Halo fans. Or perhaps Halo's developers are parachute buffs, of course.